ROBERT G. MUNROE and NANCY M. MUNROE vs. JOHN MELVIN and JANICE MELVIN. Plaintiffs bring this action seeking a declaration that the Defendants have, 1) exceeded the use granted them in an easement; 2) the Plaintiffs' right of use of the right of way has been denied by the Defendants' actions, and ; 3) that the Defendants cease to utilize said right of way for other than access. By way of answer the Defendants allege that the Land Court lacks jurisdiction over the subject matter of the complaint and that Defendants, if the right to park is not implicit in the easement, have obtained a right by prescription to park vehicles on said right of way. A trial was held on June, 29, 1982. A stenographer was sworn to record and transcribe the testimony in the case. Two witnesses testified and sixteen exhibits were introduced into evidence and are incorporated herein for the purpose of any appeal. A view was taken on December 30, 1982 with counsel and parties present. 1. By deed dated January 11, 1967 and recorded in Book 8091, Page 302 [Note 1] Francis G. Shea, Jr. and Margaret G. Shea deeded a parcel of land in Hyde Park to Defendants John B. Melvin and Janice M. Melvin. The property was described in part as being bounded "Northeasterly by land now or late of Alden, fifty-three (53) feet; together with a right of way over said passageway out to Williams Avenue." 2. By deed dated September 15, 1976 and recorded in Book 8899, Page 220, Samuel H. Sidman conveyed a parcel of land in Hyde Park to Plaintiffs Robert G. Munroe and Nancy M. Munroe. This parcel was described in part as "being shown as Lot A on a plan entitled 'Subdivision Plan of Land, Hyde Park, Mass.'" which is Appendix A. 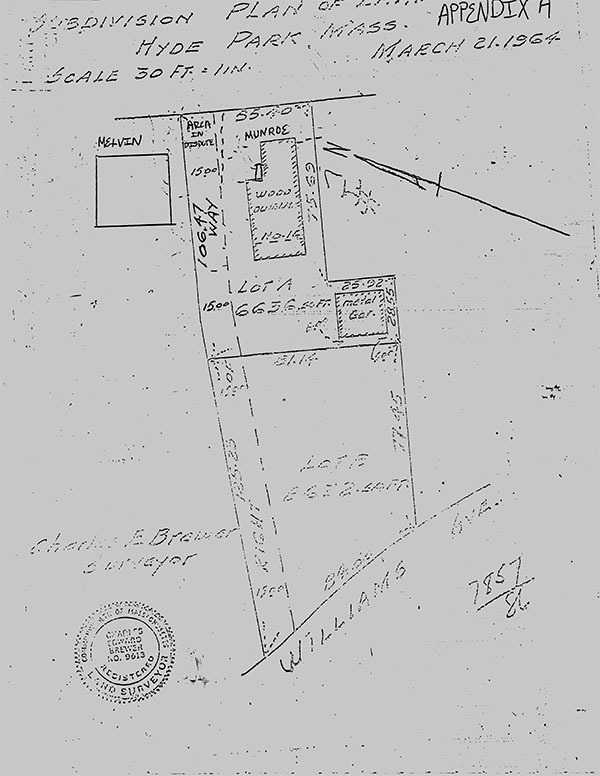 [Note 2] The deed also recites that "there is also conveyed herein all my right, title and interest in the Right of Way over said Lot B to Williams Avenue, as shown on the above mentioned Plan by Charles E. Brewer." 3. The easement in question is fifteen feet wide and runs closely between the two houses. There is no question that Defendants have parked at least one car on the easement from 1967 to 1976 and at least two cars on the easement until the commencement of this suit. As the width of the easement is only 15 feet, Defendants have parked their cars one behind the other impeding passage over the back end of the right of way. May Defendants park their cars in the easement? It is not disputed that Defendants have an easement over the Plaintiffs' land. When an easement is created every right necessary for its enjoyment is included by implication. Mt. Holyoke Realty Corp. v. Holyoke Realty Corp., 298 Mass. 513 , 514 (1937). What is disputed is whether the easement includes the right to park their cars thereon. Where an easement is created by grant, the extent of the right depends upon the terms of the grant. J.S. Lang, Engineering Co. v. Wilkins Potter Press, 246 Mass. 529 (1923). The terms of the grant in the instant case state "...together with a right of way over said	passageway out to Williams Avenue." (See paragraph 1 herein). Here, there is no difficulty with construction as the terms of the grant	are unambiguous. Defendants have a right to drive over the easement. They do not have a right to park cars on the easement. Plaintiffs, as owners of the servient estate, possess all the rights of owners except as limited by the easement; they cannot interfere with Defendants' rights in the way. Crullen v. Edison Elec. Illum., Co., 254 Mass. 93 , 94 (1925). As set forth above the easement sets forth that it is for a right of way "out to Williams Avenue." It is for ingress and egress only. The easement does not give the Defendants the right to park cars thereby obstructing the way and interfering with the Plaintiffs' rights as owners of the land. To do so would be an invasion of Plaintiffs' title as owners and is not within the easement to travel over the way granted to Defendants. New York Central Railroad v. Ayer, 242 Mass. 69 (1922), Crullen v. Edison Elec. Illum., Co. supra and cases cited therein. Although Defendants have alleged that they have acquired a right by prescription to park their cars on the way, the Court finds and rules that insufficient evidence was presented to support such a claim. In order to acquire an easement by prescription the use must be open, notorious, continuous and adverse for twenty years. Ryan v. Stavros, 348 Mass. 251 , 263 (1964). Defendants have used the way to park at least one car since 1967; some 16 years. There is no evidence that their predecessors in title used the way for four additional years. Thus, Defendants have not met their burden of proof. In sum, Defendants may not block the easement, by parking cars or otherwise as both Plaintiffs and Defendants have a right to pass over the way. Everything must be within reason, however. The prohibition against parking of cars has to be construed reasonably, It does not mean that the cars cannot be left for a short time, for example, to unload groceries (and passengers for that matter). But certainly the passageway cannot be blocked by the Defendants' parking of their automobiles for any protracted period of time. In addition, the Defendants have no right to go over other land of Plaintiffs to turn around and they have no right to use the entrance to Plaintiffs' garage for a turnaround. Defendants have submitted a document entitled "Defendants' Requests for Rulings" which contains 5 requests for rulings. All 5 requests are allowed. [Note 1] All recording references are to the Suffolk Registry of Deeds unless otherwise noted. [Note 2] Appendix A is a copy of Exhibit 14 which is entitled "Subdivision Plan of Land, Hyde Park, Mass. Scale 30 ft.= 1 in., dated March 21, 1964 by Charles E. Brewer, Surveyor, to which the Court has added certain notations.